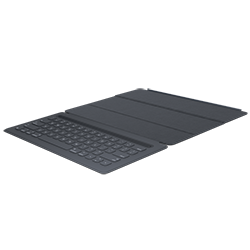 shopaztecs - Smart Keyboard for iPad Pro 12.9"
aztecnology → Accessories → Smart Keyboard for iPad Pro 12.9"
Smart Keyboard for iPad Pro 12.9"
The Smart Keyboard frees you from switches, plugs, and pairing. Fully portable, it connects to iPad Pro easily, with no batteries required. It also folds neatly into a lightweight, durable cover for outstanding protection.